Thanks to our selection last week, Fabianski (5.0) retains his place in our squad for this gameweek and is our top choice keeper for this week. He wins his place over his counterpart Mignolet (5.0) as the Merseyside team travel to London to play Arsenal. Darmian (5.6) would be a good bet this week given his performance in his teams first two game weeks. Further, Manchester United start of the game week against Newcastle hence this selection makes a lot of sense. Assisting Darmian in defensive duties this week for our team would be Targett (4.0) and Oxford (4.0) who have impressed many fantasy managers recently with their performances and additionally, face relatively easier teams in Watford and Bournemouth. Our spare defender selections this week would be Nathaniel Clyne (5.5) and Miguel Layún (4.5). Owing to last week’s selection, there are no changes in this week’s selection of midfielders. Mane (8.0). Mahrez (5.7), Sanchez (10) and Silva (11.0) are our main 4 midfielders for this week. Albrighton (5.1) holds his place on the bench in case any one of our main selection cannot make it to the pitch on game day. 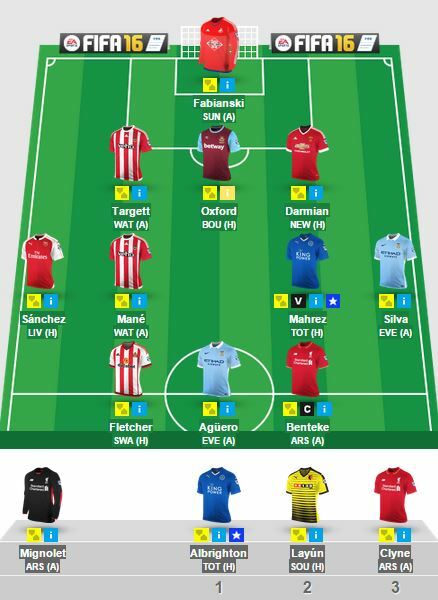 Aguero (13.1), Benteke (8.5) and Fletcher (5.0) form our strike force on the eve of gameweek 3. Aguero wins his place over Kane owing to the latter’s dip in form. Last week Benteke won the race for the armband; however, this week he relays the same over to newcomer Aguero (at least that is what our captain’s analysis reveals). Fixtures play a major role in this week’s selection.